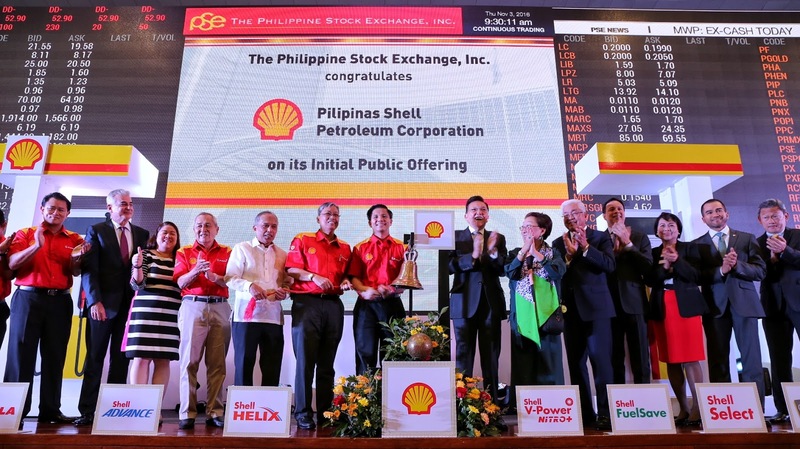 Energy Secretary Alfonso G. Cusi led the ringing of the Philippine Stock Exchange (PSE) bell together with the new and former Pilipinas Shell Petroleum Corporation (PSPC) Country Chairperson Cesar G. Romero and Edgar O. Chua, respectively, during the oil company's initial public offering on November 3, 2016) in Makati City. Other PSPC executives and Board of Directors of PSE joined the Secretary during the ringing of the bell, which also signals the start of the trading in the stock exchange. In his keynote address, Cusi said: "By its entry to the stock market, Pilipinas Shell subjects itself to State regulation and public scrutiny on another front—this time as a publicly listed company." Cusi noted that "it is all the more imperative for the company to constantly maintain not only an impeccable delivery of public service in the field of energy, but also sound corporate fiscal discipline and an attractive and wholesome corporate image in the community." "Now, Pilipinas Shell will owe utmost diligence and protection not only to consumers in the form of cleaner and more affordable petroleum supply, but to the investing public as well, in the form of high-value and profitable investments," Cusi explained.